Property 15: La Casetta, Casole d'Elsa, Siena. Join the real Tuscany countryside! 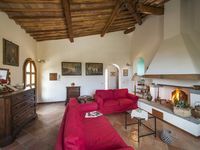 Pleasant characteristic hayloft that has been renovated into holiday apartment in a part of the Chianti that is ideal for visiting the most important towns. Property 18: Pleasant characteristic hayloft that has been renovated into holiday apartment in a part of the Chianti that is ideal for visiting the most important towns. Charming farmhouse of the 1800s on a hillock between magical valleys and Sienese hills. 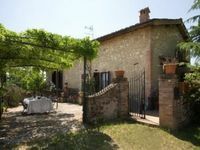 Property 39: Charming farmhouse of the 1800s on a hillock between magical valleys and Sienese hills. Casa Gaia - "Borgo Calcinari"
Property 45: Casa Gaia - "Borgo Calcinari"
My husband and I spent a month with Fabio &amp; Urszula and didn't want to leave! We can't possibly do their hospitality justice in this review, but will try our best. The night we arrived it was around 9pm and we were not prepared to cook dinner for the evening. Fabio and Urszula saved us and cooked us pasta! (As well as some delicious wine Fabio produces their and sells in the area). Far beyond their duties as hosts. But this was only the beginning. From showing up at the door with roasted chestnuts, apples from the tree, fresh bread from the bakery, wine, olive oil and just their smiling faces often, we grew to enjoy their company greatly. They keep the apartment very clean and even changed our bedding and towels for us very often. The space is lovely and we enjoyed it greatly. We cooked in often, just because we enjoyed being there. The area is great for going for walks. We even walked to a great winery down the road called Poggiarello a couple times during our stay for tastings and even a 4 course meal one night. Fabio spent time with us, taking us around the countryside and into Siena. We were fortunate enough to be there for the Palio, and Fabio took us into Siena for the entire day! From start to finish he knew exactly where we should be to experience each part of the event. It was simply unforgettable. He had fabulous meals in the countryside per Fabio's recommendations as well as in Siena. Fabio remembers WWII and took us to a couple of very meaningful sites in the area. We greatly enjoyed this. He also took us to see his friend's heard of pigs! We ventured to two of the area's hot springs and many of the hill towns and wineries. Besides spending a lot of time in Siena and around Sovicille, we especially enjoyed the Monalcino Area. Recommend checking out some of the Brunello wineries as well as Castello Di Ama for good Chianti Classico and a fabulous lunch. We took the train to Florence several times as it was very cheap and easy. You will of course want a car to fully enjoy the area as we did. Fabio's olive oil is perhaps the best we've ever tasted, and we are in the food industry specifically dealing with olive oil. We got to go see the process of the olives being pressed as we were there during the olive harvest. As you can see, there is much to do using Podere San Giusto as your base. We are so grateful for the time we had. We truly consider our time with Fabio and Urszula an immense blessing. You will not find better hosts in Italy. Santa Chiara was a great base for our visit to Siena and all of the great surrounding towns of the Tuscan countryside. It was wonderful to be in the country surrounded by the olive orchard yet only a 15 minute walk from city center. The apartment is very spacious and has everything that you could need. Anna was a great host and was very helpful in providing us with suggestions for sights to visit and places to eat. We would definitely stay here again.